So now you have bought all your 3D printer parts, the shopping spree is over and you are faced with putting all the bits together. If you have sourced your parts correctly then this is not going to be that big of a problem. Generally speaking the different models of 3D printer that have been designed have been well thought out and many builds have happened before you so that the design is optimised for ease of build as well as functionality. There are as always, good 3D printer build instructions on the web. We are using the Prusa i3 Rework as our example printer build and there are very good instructions on RepRap.org for the Prusa i3 rework build. We found these to be very good for what we are doing and it is probable that you will find a equally good source for your build instructions. 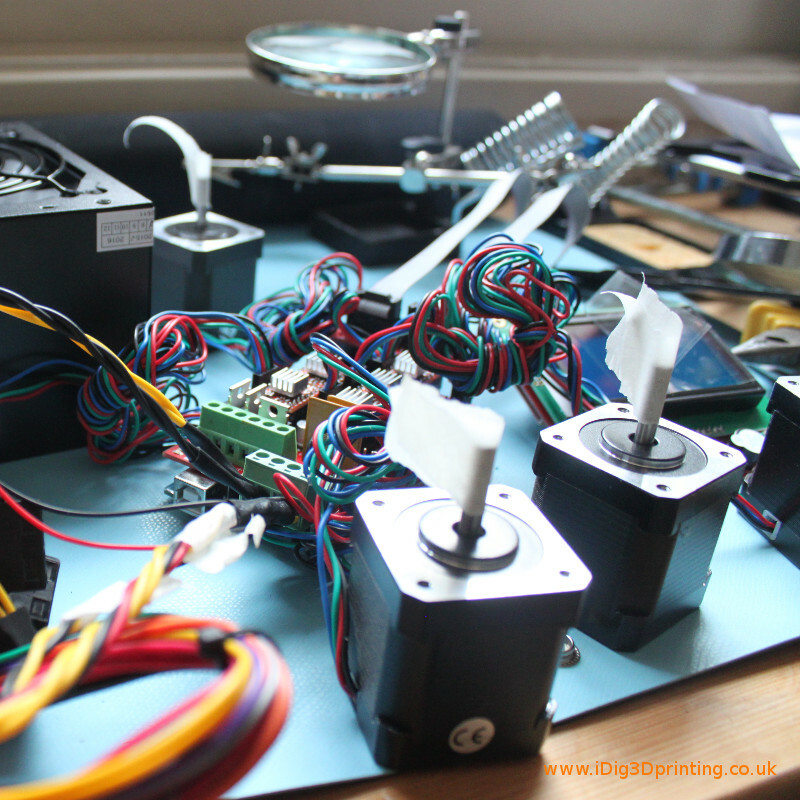 We are, in keeping with the ethos of this series of articles on building your own 3D printer, not really going to go into a step by step guide to building the Prusa i3, we will mention a few sticking points that we encountered, this will hopefully help you to head them off before you get started. The main issue with your 3D printed parts are going to be that you will need to make the holes in the printed parts large enough to take the various nuts and bolts that you will use to put it together. You will find that some of the holes are very tight, which is good, and may be too tight to accept what ever it is that is supposed to be threaded through them. Where you encounter this issue will be variable depending on the printed part. We encountered most issues with the extruder. The way that we got the holes to the right size was to use the appropriately sized drill bit to drill out the hole, by hand, rotating the drill counter-clock wise slowly, taking care not to de-laminate the layers of the printed part. The same issue of fit can occur with nuts. A lot of the printed parts have hexagon shaped indentations to take a nut. These may be too tight, or not an exact enough print to allow for you putting the nut in. 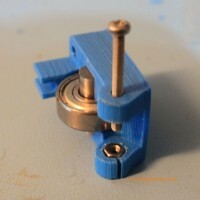 To get around this you can heat the nut up and then press it into the printed part. The heat of the nut should soften the plastic sufficiently to allow you to press it in. With the extruder body itself we also need to widen the hole through the extruder body that feeds the filament to the hotend in order for it to take a 4mm diameter length of PTFE tube. Care must be taken when actually drilling a hole, using a drill, as the friction that develops is enough to melt and so distort the plastic, drill slowly if possible. Ideally use a pillar drill so that the hole is straight otherwise you can develop bends in your, what should be straight line, that will result in kinks and bends in the filament, leading to under-extrusion problems later. In general the quality of our 3D printed parts was good, our seller had also included some duplicate parts were they we not confident the, presumably their first attempt, was up to scratch. Just remember that they are plastic, will melt and can split if put under too much stress so treat them nicely when you assemble it and try not to go pulling great chunnks off or being overly enthusiastic with drill bits. The better the fit the less movement you will get in your final build. When you start putting your parts together, remember to read ahead with what ever guide you are using and pay particular attention to the small details. You don’t want to be in the position were you need to take it apart again because it is not built correctly. With our Prusa i3 there are exact distances for the width between the four corners, get these right and get it square. Be careful when fitting your linear bearings onto the smooth, linear, rods. There is a tendency, especially in cheap linear bearings, for the action of pushing the rods through them to result in the ends of the rods catching on the bearings, dislodging them and so removing them from the runners. Once the rod is through the centre hole things are fine but it is getting the end of the rod through smoothly. Make sure that the rod is held straight to the hole and do it very gently, stop if there is the slightest amount of resistance. Having chamfered edges on the end of the smooth rod will ameliorate this risk as will buying some decent bearings in the first place. Get your belts as tight as possible. This is a bit fiddly and requires an extra hand really, but it is very important if you want accurate 3D prints. Belt slippage can cause a lot of issues and will result in staggering occurring during your print. Lastly, specific to our build we encountered an issue with the endstops and the Frame. In the case of the endstops, they did not accommodate our screws very well. In the end we had to use a small screwdriver to lightly prize up the molex connector of the endstop to get the screw head underneath it (see photo – left). 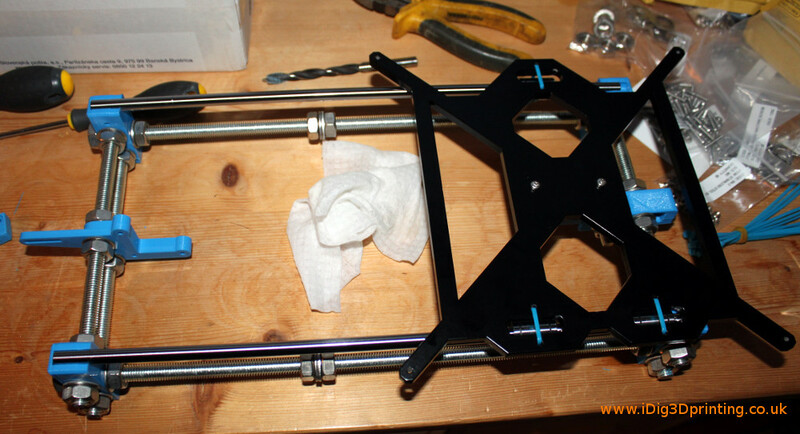 With regards the frame, we found that we could not get the screws through the holes to attach the Z axis mounts. To a large part we believe that this was to do with the black coating that the frame had. Our options were to drill out the holes or to tap them, thereby giving them a thread. In the end we decided on the later but drilling them out would have been very easy. All in all though it was actually quite straight forward. The mechanical construction of the Prusa i3 was a lot of fun. There are so many guides out their that it is easy to find one that suites your design and you are following in the footsteps of many people that have done it before you. Get the control system, the electronics set up correctly proved to be the biggest issue. To some extent this was down to our choice of board, the Ramps 1.4. Other control boards probably won’t have these problems. Connecting everything was quite straight forward. One of the first things we had to decide was how to power the 3D printer. Rather than use a LED power unit, with no safety features, we went for a general ATX power unit. The issue with this is how to connect it up. 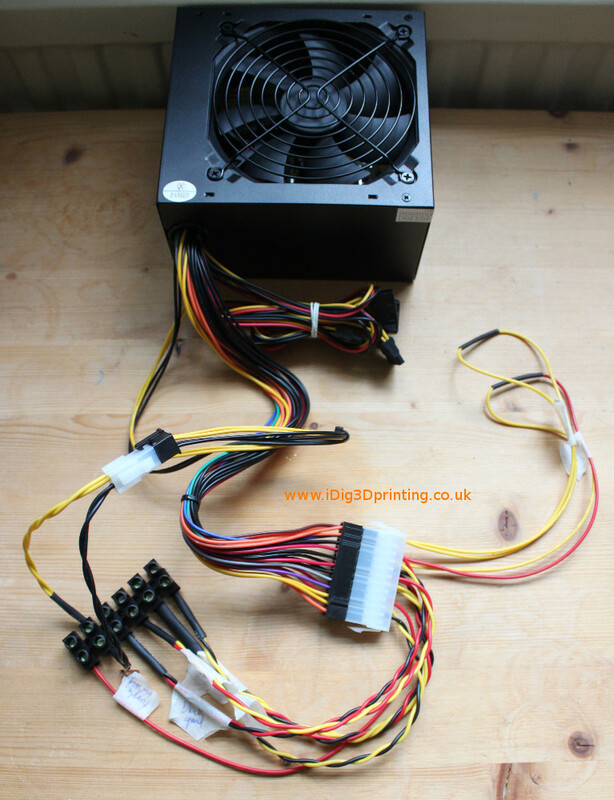 There is information out there on how to do it, one method is destructive the other not and we chose the later which required buying some extra molex connectors. We found the instructions for wiring your ATX without modifying it here. This presented no problems except that one of our original the molex connectors melted, so don’t buy cheap ones. The heated bed draws a lot of power. 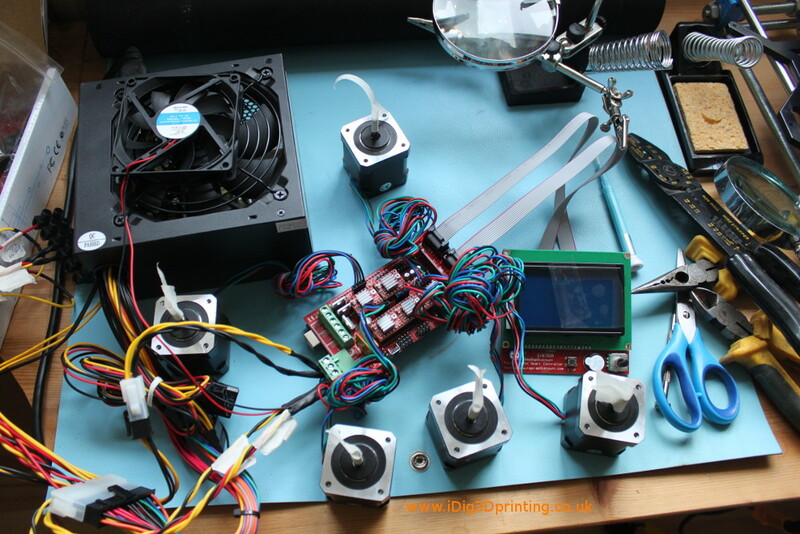 So once that is all done, connect everything up, including your stepper motors, as per your board instructions, and load on your firmware if not already loaded. What this will do is allow you to get the correct settings for your stepper motors and ensure that they are turning in the right directions before your add them during the construction of the printer. It’s a good idea to label all of your wires, 12v, 5v, live and neutral etc… as well as put some tape on the spindles of your steppers so you can see what direction they are turning in. For our Ramps board we used Repetier Firmware. This required downloading the firmware and also the Arduino IDE software so that we can upload it. Firstly you will need to check that you can connect the Arduino IDE to the Arduino board (make sure you select the right board and also port). Once you have the firmware on your board you can manually control the stepper motors, either by connecting it to something like Repetier Host on your PC or via a LCD screen attached to the board. You may have to spend a bit of time working out what setting to change in your firmware’s configuration.h file to get you LCD to work. The Repetier Firmware wizard can help with this. So now, either from the host software or via the LCD you can manually move the stepper motors by selecting to move increments on the X, Y, Z and Extruder. You will have to turn the trim pot on the stepper drivers to get the correct Vref. The last issue we had was with the heated bed. 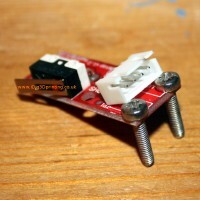 Essentially, one of the failings of the Ramps board are the resistor on the heated bed circuit. This will get too hot and switch off effectively so that your heated be never reaches a high temperature. So one thing you must do is ensure that you have a good PC fan over the board to keep it all cool. In the end this was still not enough so we ended up rewiring out circuit from the heated bed to the board so that the power did not go through the board directly but the Mofset on the ramps board was still used to switch the power off and on to the board. 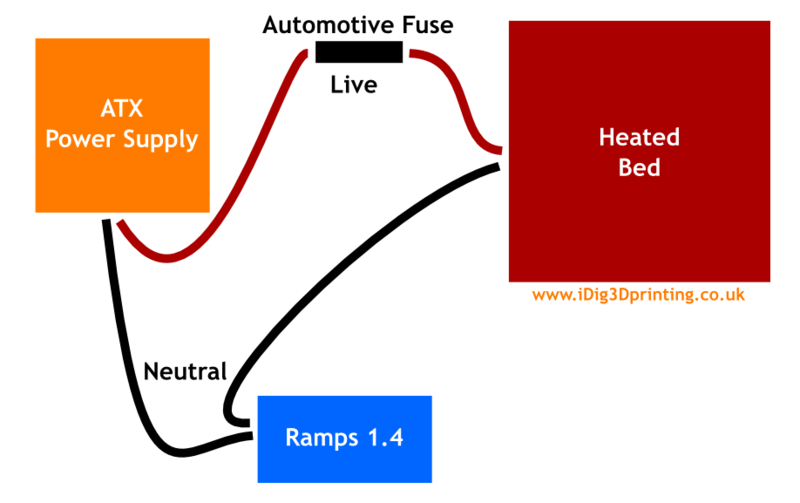 So as we said this is not a definitive guide but hopefully it will give you some confidence for entering into a 3D printer build project. We would appreciate your comments and advice that we can add to our guide so Good luck and enjoy. NOTE: This is just information on what we did, mess with electric at your own risk. If you don’t know what your doing don’t do it! We haven’t currently had any issues with our set up but that does not mean that there are not problems with it.